Domino’s Pizza: “Alleged robber asks victim out for date” After two men robbed a Domino’s Pizza delivery woman, one of them called the victim from his cell phone to apologize, and to ask her out. Burger King: “Drive-through dispute gets suspect jail food” Workers at a Burger King in New York got into a dispute with a customer after he refused to turn his music down while ordering at the drive-through. The customer grabbed the restaurant’s manager, tried to pull her through a window and then attempted to run over a worker who came to help the manager. Taco Bell: “Employee accused of faking being cop” A Taco Bell employee was arrested for impersonating a law enforcement officer and attempting to arrest his managers and co-worker. He passed himself off as an undercover narcotics investigator, going as far as typing fake criminal histories on the general manager, two shift managers and an employee and telling them they were going to be arrested. McDonald’s, Part II: “Man demands coupons from radio station employee” A radio station employee was threatened at gunpoint when an angry patron was unhappy with the promotional bumper stickers he received. The patron demanded McDonald’s coupons instead; when the employee didn’t have any, the man flashed what looked like a handgun. She searched her car and found a coupon for a free cheeseburger. The man took it, made a derogatory comment about the radio station and rode away on his bike. Wienerschnitzel: “Wienermobile gets cop roasted” When a 27-foot-long, 11-foot-tall vehicle, known to most as the Oscar Mayer Wienermobile, was slowing traffic in a construction zone in Arizona, an officer ran its “YUMMY” license plate to make sure it was street legal. A bad computer entry erroneously showed the Wienermobile as having stolen plates, forcing the officer to pull it over. After further investigation, the officer learned that the entry should have read that license plate had been stolen, but only if found on any vehicle that isn’t a giant hot dog. “Cola wars get physical as Pepsi worker attacks Coke employee” Two employees from the rival companies got into a tiff over shelf space in the aisle of a Wal-Mart in Indiana. The Pepsi worker allegedly assaulted the Coca-Cola employee, hitting him in the face, giving him a black eye and breaking his nose. Police say the two were also accused of trying to run each other over with pallets full of soda bottles. 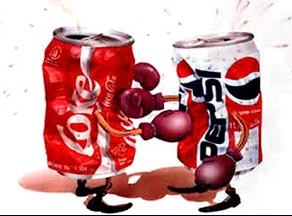 While I don’t condone violence, even in the Cola Wars, my money is on Pepsi in this round. But then, I always choose Pepsi over Coke, even when I write: The cola cameo in HONK IF YOU HATE ME went to the Big P.
Happy New Year, everyone! Have a Pepsi on me. **News clips from “Weirdest Work Stories of the Year” by Rachel Zupek posted on www.cnn.com, stories provided by CareerBuilder.com.